The Renegade Series is Sun Welding's best bang for your buck safe. 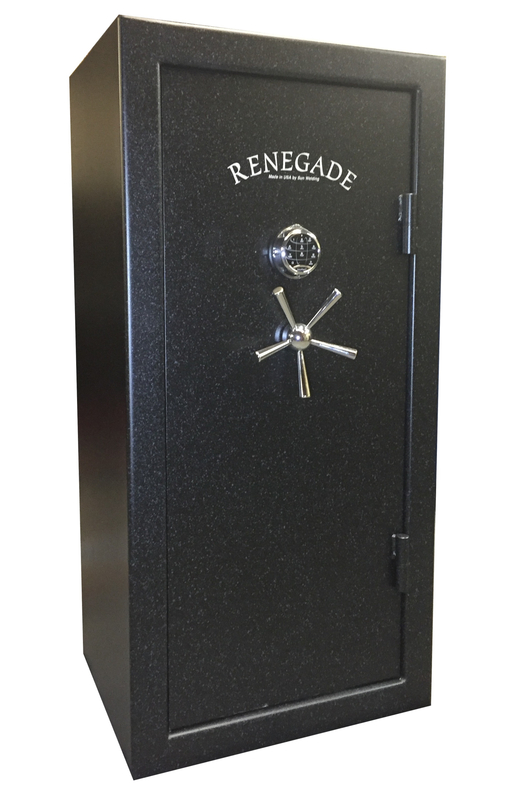 The Renegade Series is designed as a basic series to compete with the imported safes. Best value for the size! 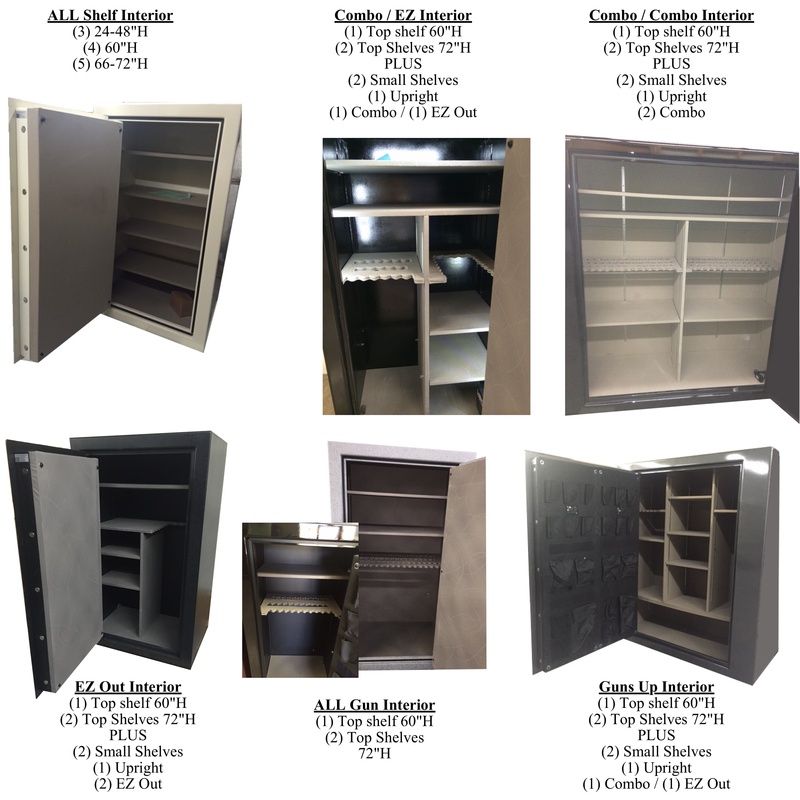 Offering a solid 3/16" steel plate door and 12 gauge steel body. 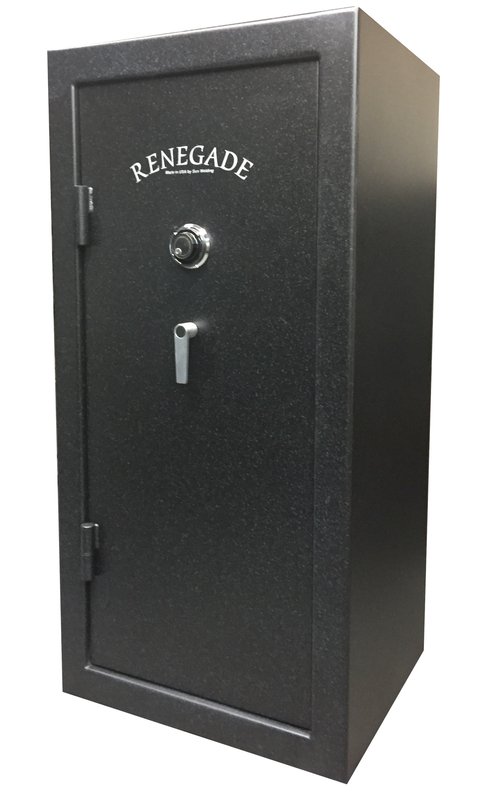 The Renegade series offers a Group II combination lock or Electronic lock. 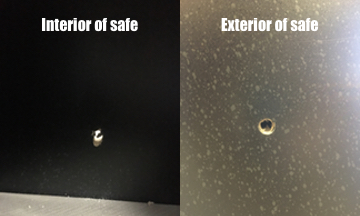 The lock is protected by a 1/2" hard plate and absorption plate, to resist from impact, drilling, or punch attacks. In addition, the independent two way bolt works are protected by two spring loaded re-locking systems which lock the entire bolt works together. The two way bolt works offer five active bolts on the opening side and five dead bolts on the hinge side of the door. The Renegade Series also comes standard with fire insulation for protection rated at 1200_ for 30 minutes (up to 1 hour available). 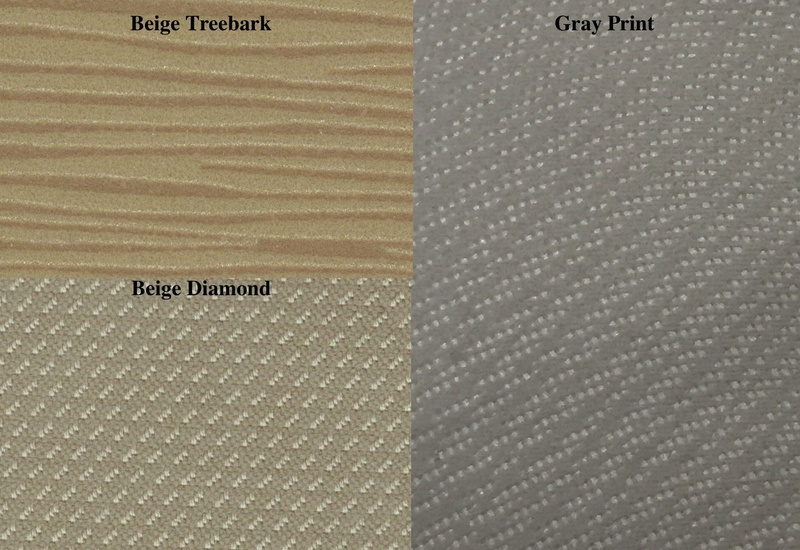 The UL fire insulation protects all six interior surfaces. The door is sealed with a heat expanding seal, swelling up to eight times it's size. A fully adjustable interior is available in several different options. 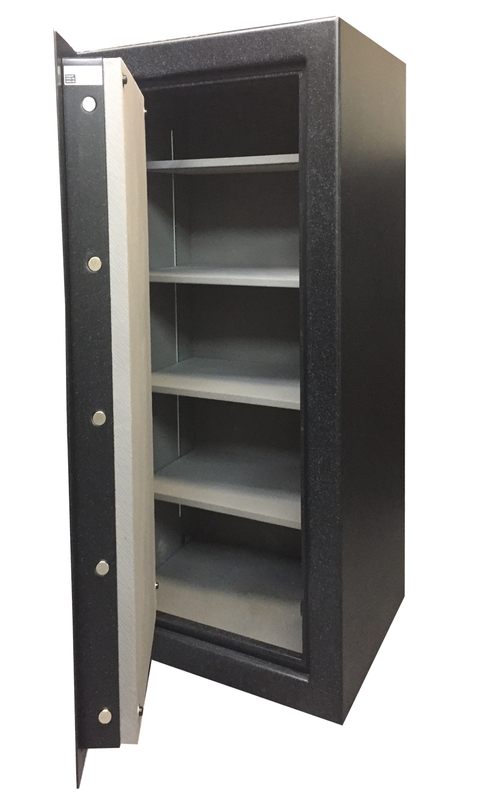 Designed to maximize your interior gun capacity while also providing the most shelving space available. The finishing touch is the hand applied artwork. Exterior finish comes standard in matte gray. 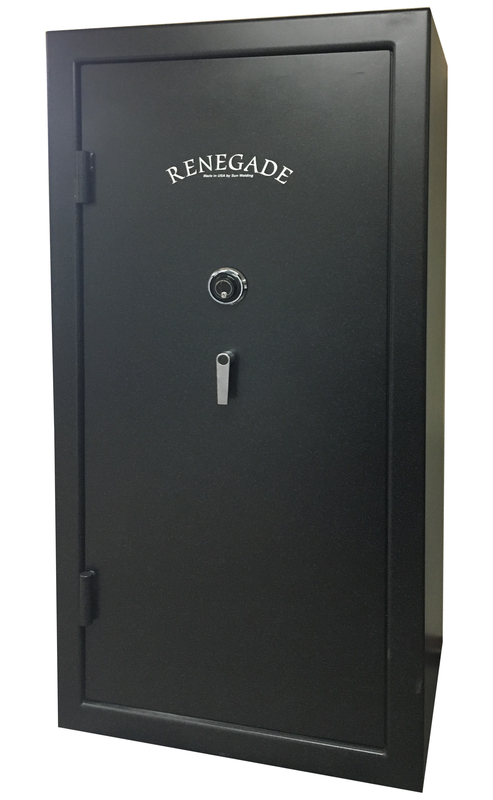 The Renegade Series is the perfect safe for a garage or work space. 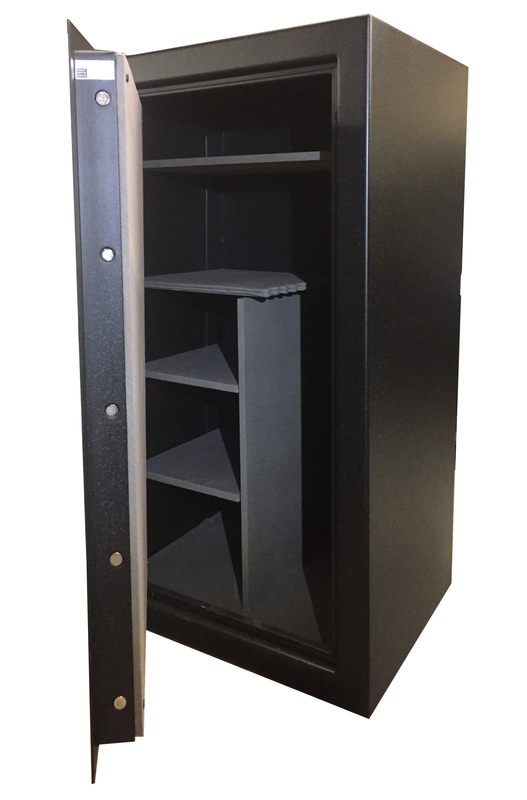 Nothing negative to report on this gun safe - apparently they've been around for awhile, just had not heard of them. Looks great in my office. I don't usually leave reviews unless I'm angry - but I had a really good experience with this company and the safe is far better than expected. Saved a ton of money. WANT TO READ MORE ON HOW SUN WELDING BUILDS EACH SAFE, VISIT HOW THEY ARE BUILT. 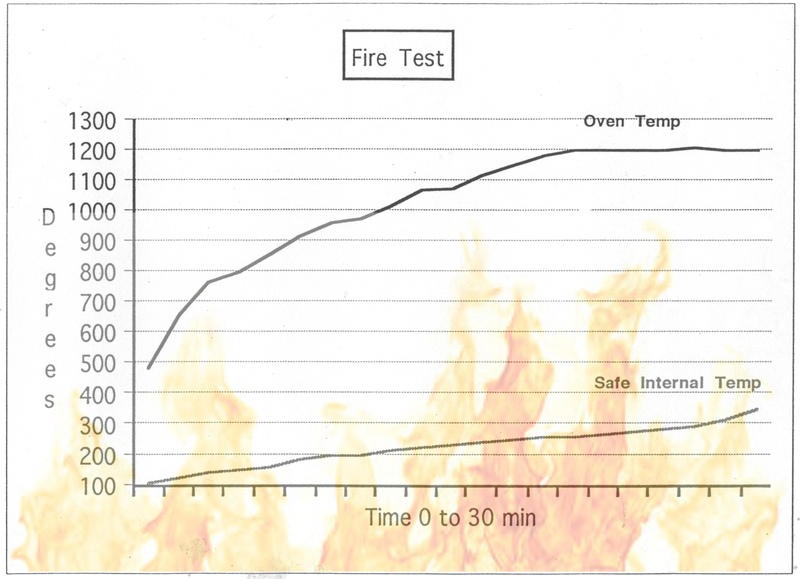 The fire test was performed with a safe being placed in an oven that was 1200_. At 'x' minutes the internal temperature of the safe reached 350_. 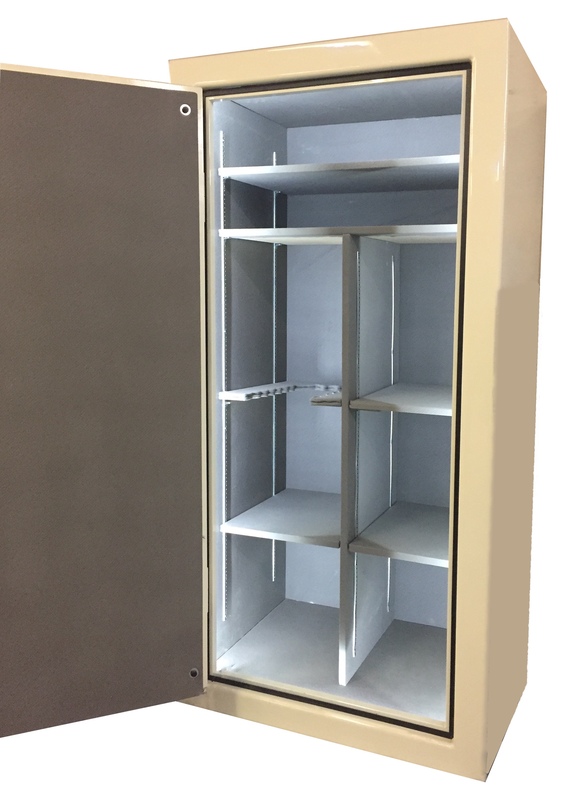 The overall burn time of a safe in a fire depends on many different factors such as the temperature of the fire and the length of time the fire burns around the safe. 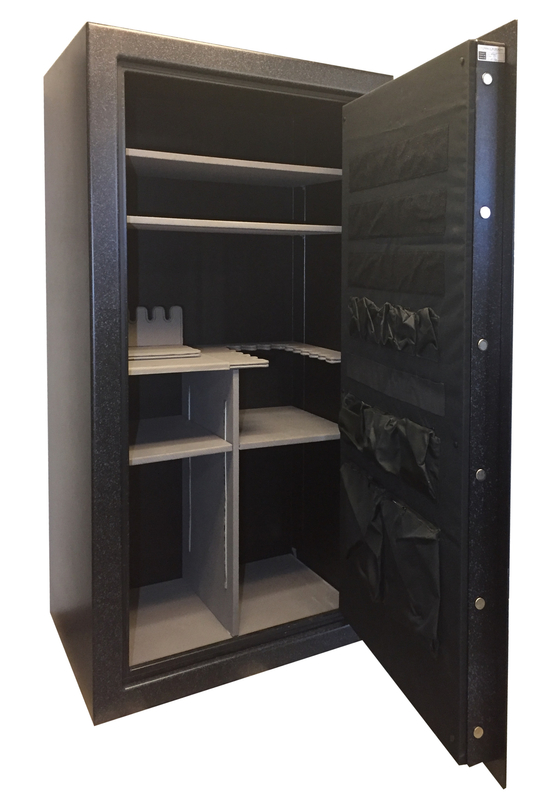 The safe door also includes a smoke seal around the door to prevent smoke from entering the safe. Electrical Access Hole - provides a small 3/8" hole in the side of the safe for DriRod wire. 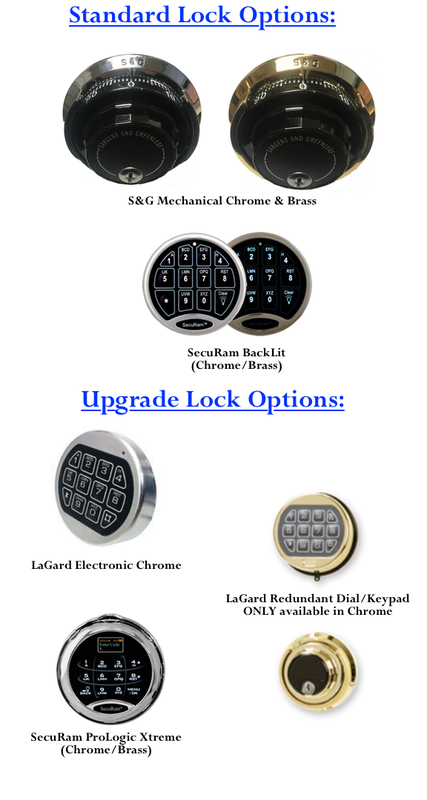 Extended Lock Warranty available in 10 year or lifetime for; BigRed Mechanical Lock, S&G Mechanical Lock, LaGard Electronic Lock, LaGard EMP Electronic/Mechanical Lock, SecuRam Electronic Lock, or SecuRam EMP Electronic/Mechanical Lock. 12"DriRod - eliminates moisture from staying in the safe. Keeps guns from rusting. 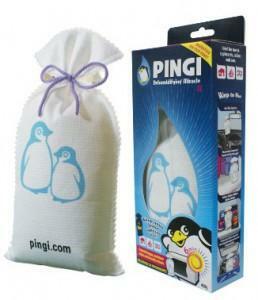 300 Gram Pingi - absorbs moisture from staying in the safe. Keeps guns from rusting. Extra Small Shelf - Need more storage? Add an extra side shelf. 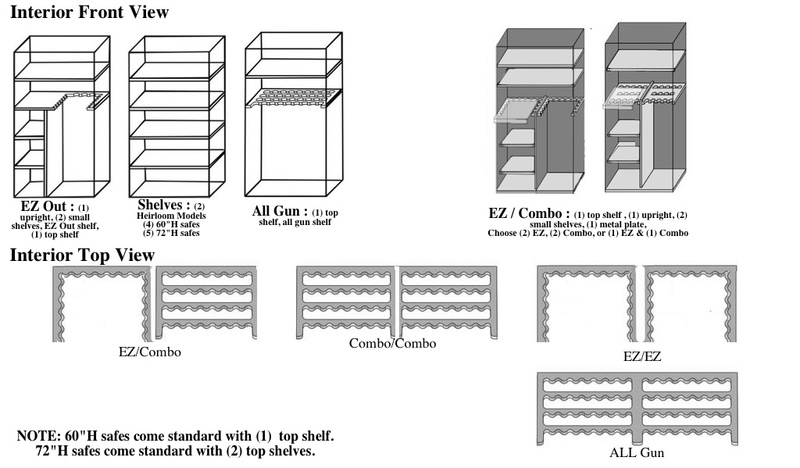 Extra Top Shelf - Need more storage? Add an extra top shelf. 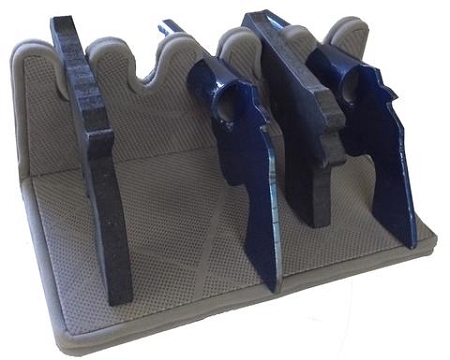 Notched Top Shelf - Allows longer rifles more height without having to move your top shelf. 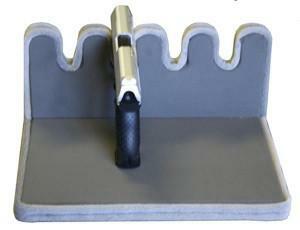 Change Tool - Allows you to change the mechanical combination to your safe. 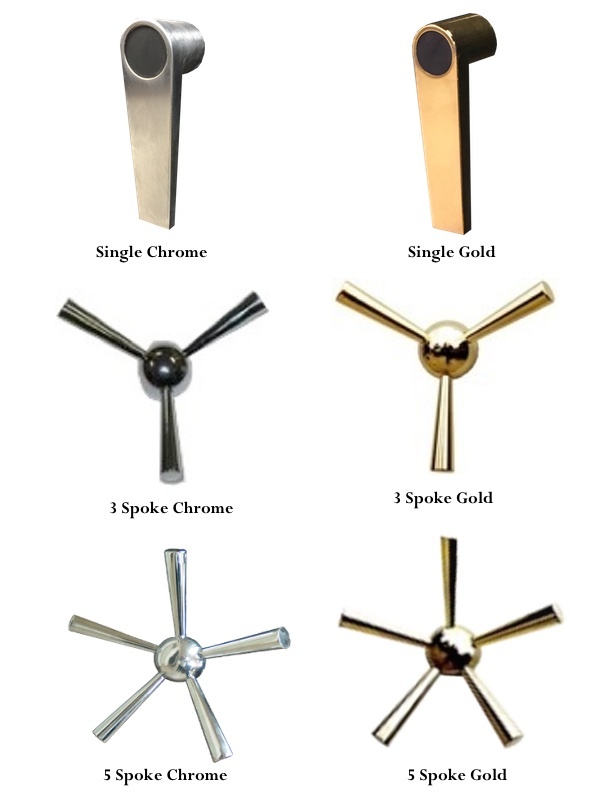 A locksmith is always the best and most reliable method of changing the combination. Need a locksmith check out SAVTA. Double Box for Shipping - Adds protection during shipping. Door Organizer - Offers additional storage for handguns, documents, and more! LED Light Kit - Offers lighting inside the safe. Available with a external plug (AC) or battery box (DC). Select the install option and have the lights installed before shipping. Anchor Kit - Bolts required for mounting your safe to the floor. Looking for shipping options? We ship throughout the USA (including AK and HI). 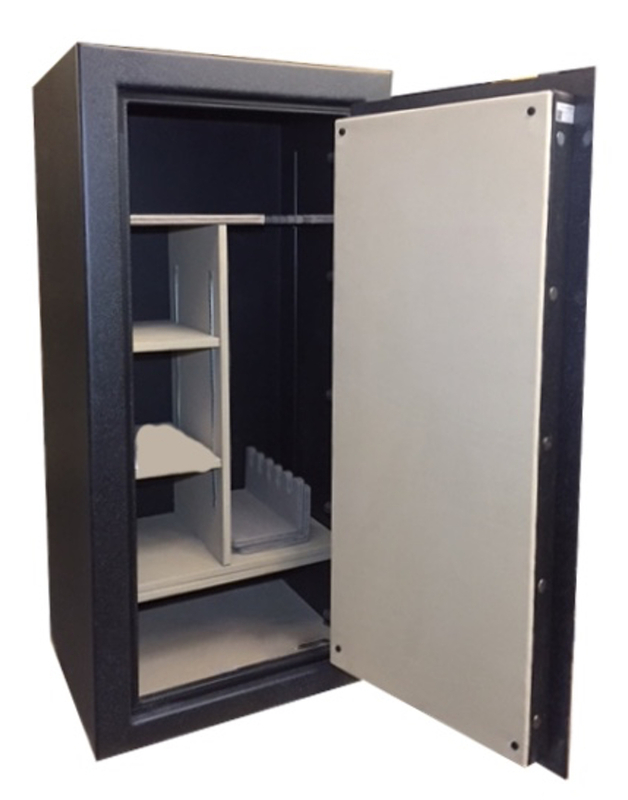 While the website generates an estimated shipping cost for a basic 30 minute fire rated safe your freight charge might be different. We also offer additional options such as garage delivery and inside delivery up to 700 lbs. FREE Shipping* may also be available! Call (805) 584-6678 or email info@sunweldingsafes.com to talk to one of our friendly safe experts! Local Pick Up: Sun Welding will assist with the loading of the safe into the back of a trailer, pick up or SUV. We suggest you bring moving pads and tie down straps, as the safes do not come standard foam, boxed, or on a pallet. We offer theses items at an additional charge. 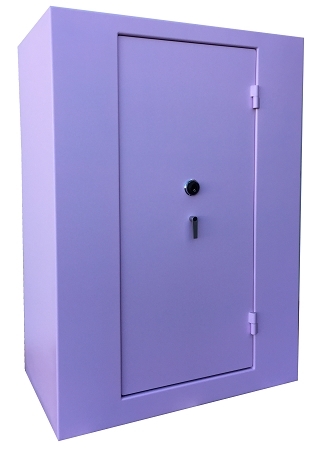 The purchaser is responsible for tying down the safe as they see necessary. If picking up with a pick up or SUV Sun Welding will only lay the safe on its back for transportation. Having the safe on a pallet is not recommend as it is more difficult for the user to maneuver, unless you have a pallet jack at the end location. Local Delivery: Customers located within Sun Welding's delivery area please call 805-584-6678 for a quote on delivery. Sun Welding offers curbside drop off, garage delivery, and inside first floor delivery. We also offer professional bolt down/installation service. Garage Delivery: Schedule business or home delivery appointments. Complete the job to your specifications as directed on the delivery form. We treat your home or business as we would our own. Inside Delivery: Schedule business or home delivery appointments. Complete the job to your specifications as directed on the delivery form. 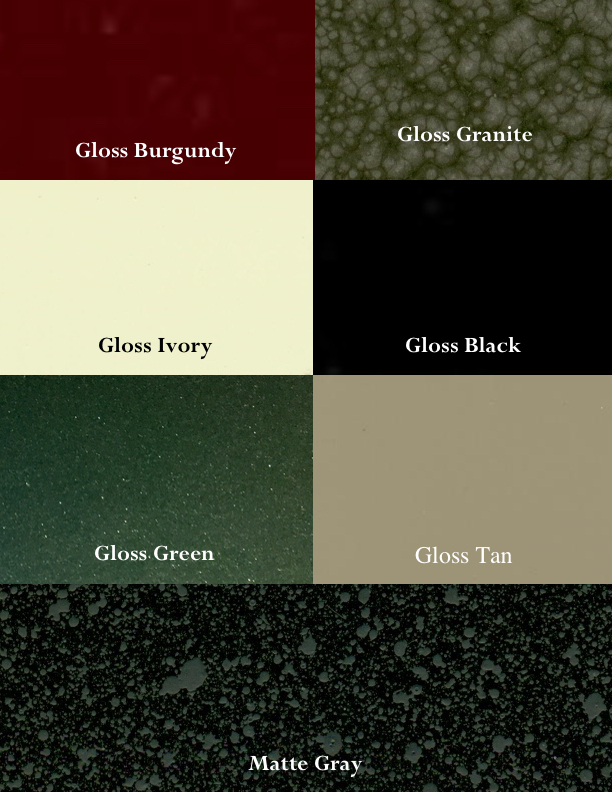 We treat your home or business as we would our own. Stairs: For up/down stairs or safes over 2500 lbs. or over 2 steps please call 805-584-6678 to setup delivery. Installation: Bolt down service is available for $85.00 on the first level of your home. Sun Welding only offers installation/bolt down to a concrete slab floor. If your home was built with a post tension floor we require a waiver signed before bolt down. If you are unsure or have questions please consult a contractor. If you have any questions about bolt down, please contact us at 805-584-6678. What to expect at delivery? The freight carrier offers standard curbside delivery, typically with a 48' semi truck. Other arrangements for a small truck (pup tuck) can be made along with garage delivery. The freight carrier will remove the pallet from the back of their truck using a lift gate and place the pallet on your driveway. At that point it is the customers responsibility to move the freight inside the home. The freight carrier will not remove the safe from the pallet or remove any of the package materials. If you would like more information on delivery, have a long drive way, or any other special request please call 805-584-6678. Lift gate included (to lower the safe to the ground) at curbside. Safe is bolted to a pallet, foam, and wrapped in a cardboard box. Inside Garage Delivery Option: ($50.00 ADDITIONAL FEE. Select this option on the product page) Access to an "overhead" garage door is required and must be over pavement or concrete. Excessively steep driveways or driveways longer than 25ft are NOT included in this service. Access to an "overhead" garage door is required. Must be over pavement or concrete. Roads with excessive turns and no turn around area, driveways longer than 25ft, or extremely long driveways are not included in this service. Excessively steep driveways (2% Grade or more) are NOT included in this service. Remote areas require an additional fee by freight company. Call us at: 805-584-6678 to confirm if your area is "Remote". Inside Home Delivery Option: ($TBD ADDITIONAL FEE. Call 805-584-6678) Access to an "overhead" garage door is required and must be over pavement or concrete. Excessively steep driveways or driveways longer than 25ft are NOT included in this service. 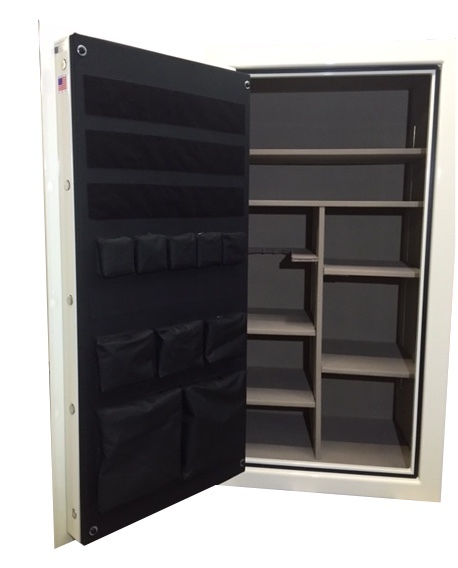 Inside home delivery is available for safes up to 700 lbs. Driveway must be over pavement or concrete. Includes 2 steps outside and inside the home. Freight company will place the freight inside your home in the desired location, remove the safe from the pallet, and take away packaging material.